Photo above: screen shot of video provided by Humberto Guízar. 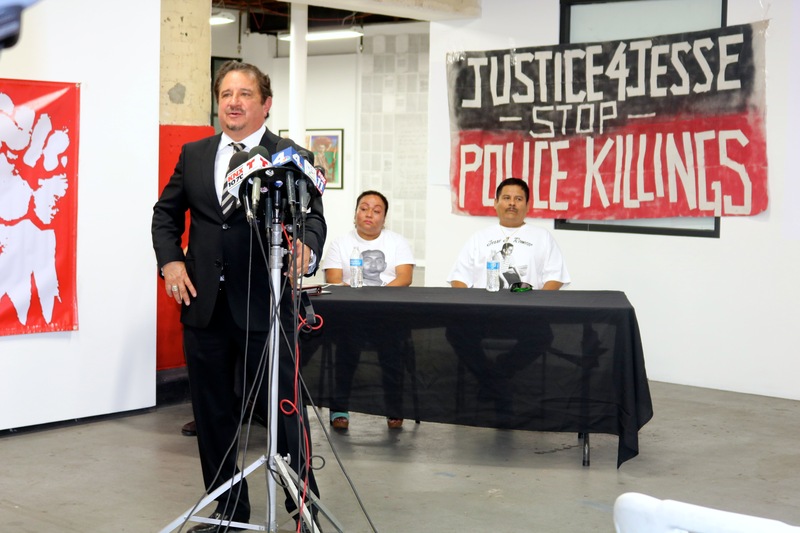 The lawyer representing the family of Jesse Romero says the body cam video from the LAPD officer who pursued and fatally shot the 14-year-old nearly two years ago contradicts the officer’s version of the incident. 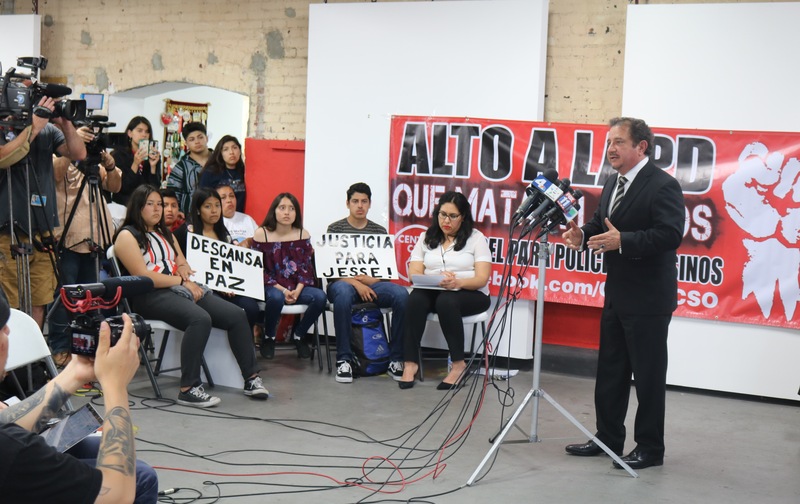 Attorney Humberto Guízar speaks at press conference where he released video from cameras worn by officers who pursued and shot 14-year-old Jesse Romero on August of 2016 in Boyle Heights. Attorney Humberto Guízar said the video “clearly shows” that Officer Eden Medina knew Romero was unarmed and did not fear for his life when he shot him. 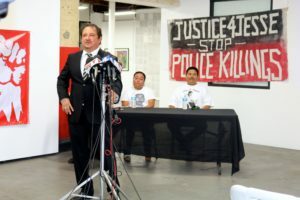 Video from cameras worn by Medina and another officer in the August 2016 pursuit was first seen publicly Tuesday afternoon at a press conference at Self Help Graphics organized by Centro CSO, a local community group. Guízar obtained the video last month when a judge granted a motion in his excessive force lawsuit against Medina and the City. Shown as video from “shooting” and “following” officers, the footage begins with the two searching for graffiti taggers in apartment building on North Chicago Street south of East César Chávez Avenue. Two-and-a-half minutes into the footage, the officers spot two boys outside the building and one of them takes off running. The officers chase him on César Chávez with at least one of them shouting at him to stop; as they approach the corner of North Breed Street, about a minute later, a gunshot is heard. Officer Medina, who is in front, pauses briefly by a pay phone, appears to peek around the corner and then turns on Breed with his gun drawn. 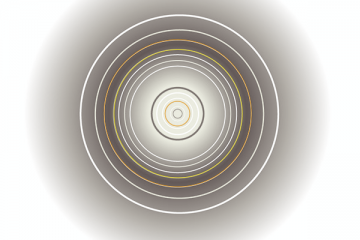 Gun fire is heard about four seconds after the first shot. Guízar argued that was enough time for Eden to realize that Jesse Romero was unarmed. He said that LAPD officers are trained to avoid any situation where their lives are threatened. The video does not show the moment when Romero was shot but it does show the teen’s bloodied body lying on the sidewalk and what appears to be his gun a few feet away, on the other side of a fence. Witnesses have said they saw Romero throw his gun over the fence. 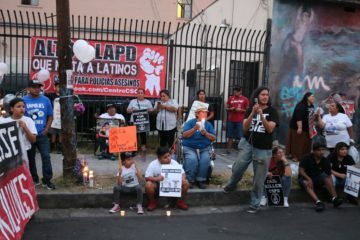 An 11-page memo released in March by LA County prosecutors who investigated the shooting explains that the gun hit the top of the fence, fell on the sidewalk and “discharged upon impact with the ground.” The memo concludes that Medina believed the boy posed a deadly threat and used “reasonable force” to defend himself and other officers. 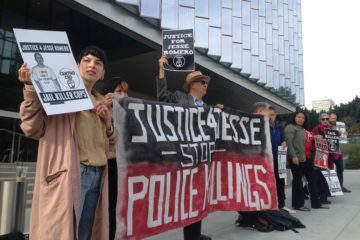 Prosecutors declined to file any charges against Medina, who had killed a man in a separate officer-involved-shooting just 12 days before the Romero shooting. 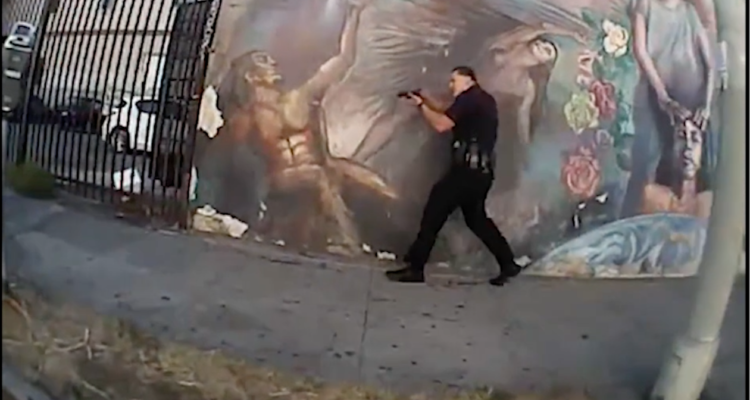 Last June, the Los Angeles Police Commission ruled that the Romero shooting was justified. Following that decision, Guízar filed his lawsuit on behalf of the teens parents, Teresa Domínguez and Jesús Romero. The parents of Jesse Romero, Teresa Domínguez and Jesús Romero, listen as their attorney speaks. When asked by a TV reporter to repeat an earlier statement, Guízar back-pedaled his categorization of the shooting as murder, saying instead he meant to say it was manslaughter. 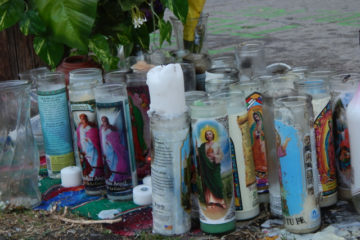 He also said he expects to get the city to compensate Romero’s family for his loss. “We want what’s fair compensation for the loss of a child,” he said. Domínguez and Jesús Romero were tearful during the press conference and declined to make any statements. Afterwards, Domínguez was pressured by Spanish-language TV reporters to answer a few questions, and she said she was angered and upset by the video. 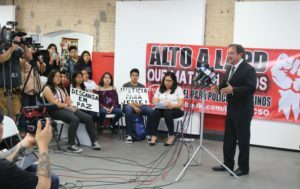 Several community activists affiliated with Centro CSO and a group of students from Méndez High School –where Jesse Romero studied– were at the press conference. A number of them called out for justice during the media event. This post was edited on 5/30 to add details.